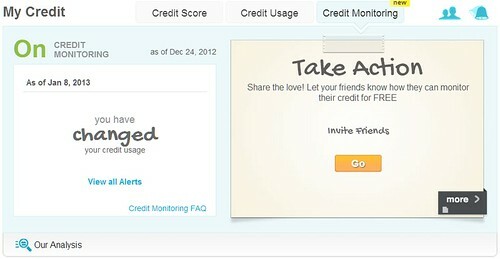 A few weeks ago, I talked about the free credit monitoring service from Credit Sesame when it was announced. I signed up for the service immediately when it became available because it is free (of course, you need to be a member of Credit Sesame, which is also free to join) and have been waiting for my credit alert since. At the time when I wrote the article, I thought that I could only view the alerts on the Credit Sesame website, which would make it less useful because I don’t think I will log into my account very often, not being able to receive alerts via email when events occurred. The reason for that impression is that I have been using a similar credit monitoring service from Credit Karma, which is almost identical to Credit Sesame, for a while now and I don’t think I have ever received an email alert. Well, looks like I was wrong on Credit Sesame. 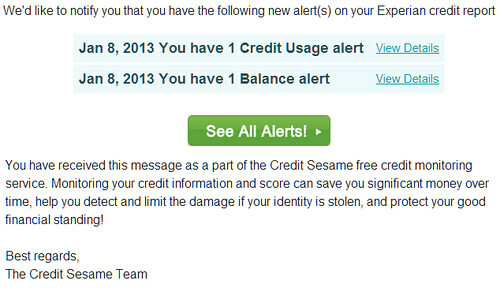 Late last week, I did receive an email alert from Credit Sesame that contained two events that showed up in my credit report after I enrolled into the free monitoring service. Of course, as you can see from the screenshot below, the email doesn’t really contain a lot of details about those event. Rather they are just brief summaries of the event. To know more about exactly what happened, I still need to go to the website and find out. And with the introduction of the new service, Credit Sesame has also redesigned its website to add a credit monitoring section, which is prominently displayed once logging into the account. For this part, I think Credit Sesame does a better job than its rival Credit Karma does. Even though I didn’t explicitly set up for email alert, I still received the notification one day after those events were posted in my credit history report. The email alert is On by default. Actually, in addition to those events mentioned in my first post that will be monitored by Credit Sesame’s free service, there are a few alerts that can be set up. To configure these alerts manually, you will need to click the the little blue bell on the top right corner of the above screenshot, which will then lead to the page for additional alerts, though not a lot. Since this was the first alert I received since the monitoring service was set up about a month ago, I don’t know how often the alerts are sent out, once a month or as they happen. 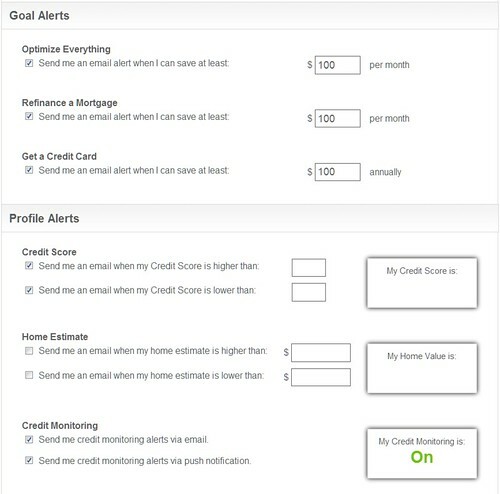 From the fact that Credit Sesame only updates credit score once a month, I suspect that the credit monitoring alerts will also be available on a monthly basis. Update: I was informed by Credit Sesame that alerts are indeed sent in real-time, as soon as the events are reported. Have you signed up to use the free Credit Sesame credit monitoring service yet? If so, what’s your experience? Do you think it is useful in monitoring and improving credit?